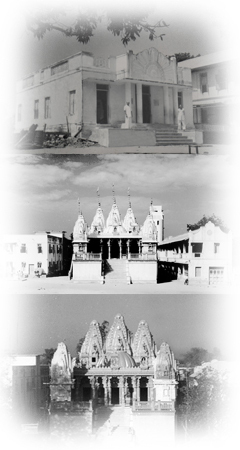 On Samvat 1998 Magsar Sud 15 (Wednesday 3rd December 1941), the day that Sadguru Shree Ishwarcharandasji Swamibapa performed the foundation stone ceremony of Shree Swaminarayan Temple Maninagar, he explained the significance of this sacred site. Having described the immense glory of the Maninagar Headquarters, Shree Ishwar Bapa performed vartman to the mango tree. This special mango tree, under which Lord Swaminarayan used to sit, is the precise location from where Shree Ghanshyam Maharaj gives darshan today. Several scriptures narrating the biography of Lord Shree Swaminarayan reference the occasions when Lord Shree Swaminarayan visited the special mango shrove, as stated by Shree Ishwar Bapa. Scripture Sadguru Shree Mahanubhavanand Swami – 84 Adyay says, “Lord Shree Swaminarayan was travelling from Aslali to Ahmedabad. Leaving Gamdi village, He made a small detour and went to the mango shorve in Maninagar. Even though Ahmedabad was not far, He still rested there.” The date of that visit was Samvat 1865, Maha Sud 1, Monday 16 January 1809. Sadguru Shree Mahanubhavanand Swami states in the Harikrishna Leelamrut – 53 Adyay, and Sadguru Shree Aadharanand Swami says in Shree Haricharitramrut Sagar, Part 12 Chapter 73, that Lord Shree Swaminarayan was travelling from Jetalpur to Khokhra Mahemdavad when He came across the mango shrove in Maninagar. It was the hot Vaishakh month, and delicious ripe mangos were hanging from the trees. The Sants and disciples bathed in the water of the lake. The date of that visit was Samvat 1865, Vaisakh Sud 3, Monday 17 April 1809. Thereafter, Lord Shree Swaminarayan did not visit Ahmedabad for another 9 years. Sadguru Shree Aadharanand Swami retells in Part 19 Chapter 45, that Lord Shree Swaminarayan was presiding in Jetalpur, when He received a message from the British Official, Sir Heron who wanted to meet Him. Lord Swaminarayan went to Vatva, and then to Ahmedabad. During that journey too, the Lord visited the mango shrove in Maninagar. The date of that visit was Samvat 1874, Vaisakh Sud 1, Wednesday 6 May 1818. On the return journey to Jetalpur, He once again visited Maninagar. The date of that fourth visit was Samvat 1874, Vaisakh Vad 8, Thursday 28 May 1818 (Shree Haricharitramrut Sagar, Part 19 Chapter 51). The Lord’s fifth visit to the mango shrove in Maninagar was Samvat 1875 Kartik sud 11, Monday 9 November 1818. In this manner, Lord Shree Swaminarayan visited the mango shrove of Maninagar, presided beneath the mango tree, bathed in the water of its lake, and made this site the source of eternal salvation. This is the site that would become the worldwide headquarters for the propagation and preservation of Lord Shree Swaminarayan’s supreme philosophy. This is the sacred site that Supreme Lord Shree Swaminarayan and His divine lineage of spiritual heirs have regarded as being their eternal home, and where He will preside forever more. This is the site of Shree Swaminarayan Mandir, Maninagar.